Why Does Nature Choose Ca2+ Ion for Water Oxidation? Cells sense and communicate with the environmental stimuli, and cells respond to these stimuli through the elaborate networks of proteins and small molecules that are collectively called the signal transduction pathways. Environmental stimuli such as water-soluble hormones and growth factors bind to specific receptors on the cell surface, and the information is relayed inside the cell through the receptors. Almost all intracellular signal transduction pathways involve some forms of protein kinases. Protein kinases are enzymes that covalently attach a phosphate group (-PO42-) to hydroxyl group (-OH) of a serine (Ser), threonine (Thr), or tyrosine (Tyr) residue in proteins. A protein kinase phosphorylates either Ser/Thr or Tyr but not both, and protein kinases are classified as Ser/Thr kinases and Tyr kinases. Intracellular protein kinases have been the focus of intense research for the last few decades, and these studies provided the bases for our current understanding of how cellular growth, proliferation, differentiation, and function are regulated. These studies also opened the door to a new era of chemical biology and led to the development of numerous therapeutic drugs. Like intracellular proteins, many secreted proteins are also phosphorylated on Tyr residues in vivo. However, efforts to characterize the significance and function of Tyr phosphorylation on secreted proteins have been hampered by the lack of any known protein tyrosine kinase that acts in the extracellular environment. We, in collaboration with Dr. Whitman’s group at the Harvard School of Dental Medicine, identified that vertebrate lonesome kinase (VLK) acts as a secreted Tyr kinase. VLK is also known as protein kinase domain-containing protein, cytoplasmic (PKDCC). Genetic studies in mice already have shown that Vlk is important for bone development. VLK has homology to intracellular kinases, but VLK does not have the primary sequence to place it in any established kinase groups. However, VLK has a signal peptide, an indication that VLK is destined for the secretory pathway. We found that VLK is present in the ER and the Golgi apparatus which are parts of the cellular endomembrane system that synthesizes and processes secretory proteins. Is the secretion of VLK regulated? VLK is expressed abundantly in human platelets. Stimuli that cause degranulation of platelets (regulated release of contents of granules inside the cell) lead to the release of VLK and VLK-dependent phosphorylation on Tyr residues of released proteins outside the platelets. These results indicate that VLK secretion can be regulated and VLK can phosphorylate Tyr residues on proteins outside the cells. What proteins does VLK phosphorylate? Co-expression of VLK with matrix metalloproteinases (MMPs) resulted in Tyr phosphorylation of MMPs on sites that are previously found to be phosphorylated in vivo. MMPs are enzymes that degrade the extracellular matrix (ECM). ECM is composed of polysaccharides and fibrous proteins secreted from cells. Virtually every cell in an animal, except the free-floating cells such as blood cells, must attaches to the ECM for its survival, growth, and function. We found that VLK also phosphorylates Tyr residues on ECM proteins, and these results suggest that VLK is a potential regulator of ECM formation and/or degradation. Using mass spectrometry, we identified 140 proteins that can be potential substrates of VLK in vivo. Among them, 48 proteins are located at the extracellular side of the cell membrane or contain a signal peptide. 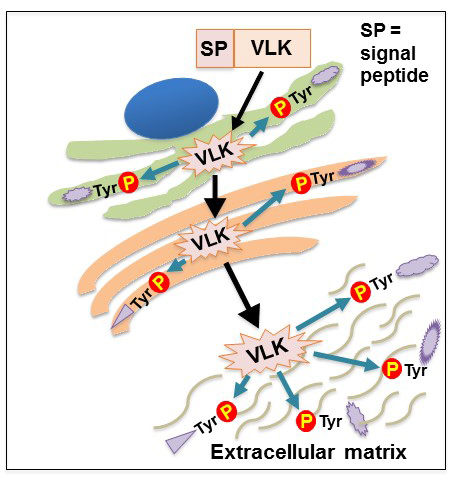 In summary, we identified VLK as the first secreted protein Tyr kinase and found that VLK phosphorylates extracellular protein and proteins in the secretory pathway in vivo. Recent genome-wide association studies suggest that non-functional mutations in human VLK gene are associated with abnormality in bone density and severity of juvenile asthma. Characterizing the precise function of VLK is likely enhance our understanding of pathological conditions caused by the excessive accumulation or degradation of the ECM. We believe this new finding will herald new avenues of research, especially in the field of the extracellular matrix biology. This article was also introduced as a “Research Highlight” in October 2014 issue of Nature Reviews Molecular Cell Biology. ​A Secreted Tyrosine Kinase Acts in the Extracellular Environment.